A saitin weave, common for silk, each wairp threid floats ower 16 weft threids. 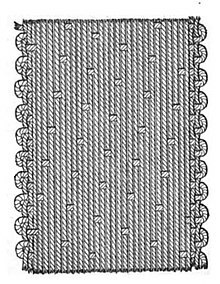 Weavin is a method o textile production in which twa distinct sets o yairns or threids are interlaced at richt angles tae form a fabric or claith. This page wis last eeditit on 23 Apryle 2017, at 03:09.